It is recommended that doors should open inwards to allow beneficial Qi to enter the house instead of outwards from outside any room. North represents `Water'. 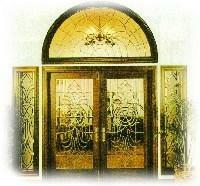 Since glass represents `Water', install glass doors only for a door facing the North. Do not install a glass door at the South facing door which represents `Fire' element. The `Fire' element clashes with `Water'. Notice the different designs of grilles? (See above picture). The one of the far right represents `Fire' with it's pointed shape. Can you guess the rest? The `wavy' patterns represent `Water' element while the squarish ones `Earth' element. There is no evidence to show the importance of selecting a preferred design for a particular direction. Selecting the design of grilles are secondary importance like selecting colours for the wall.